Held November 3-6, 2010, the theme of the 2010 Charleston Conference, the annual event that explores issues in book and serial acquisition, was “Anything Goes.” 2010 marked the thirtieth anniversary of the conference, and the theme revealed a sense of uncertainty about the future of librarianship in a digital environment marked by rapidly changing systems and practices. The conference focused on topics and themes in collection development, journals and serials management, technology and product development, collaboration between and among libraries and their communities, and managing e-book and monograph collections. 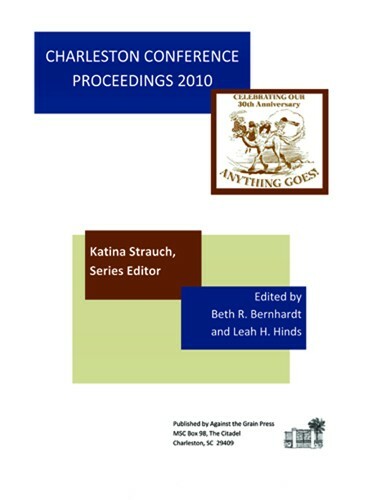 The Charleston Conference continues to be a major event for information exchange among librarians, vendors, and publishers. Conference attendees always remark on the informative, thought-provoking sessions and the collegial atmosphere where information professionals can talk directly about issues facing their industry. This volume shares the best of the presentations and panels.